Tinder is partnering with Rock the Vote to get young adults to the polls. The dating app is zeroing in on the half of users that are in the 18-24 demographic with the “Swipe the Vote” campaign. In addition to a “Schoolhouse Rock-inspired” video encouraging young adults vote, Tinder will incorporate “fun facts” about voting right into the app which users can then click on to be sent to the Rock the Vote website to learn more and register to vote. WeWork is leveraging its national footprint to increase voter registration. 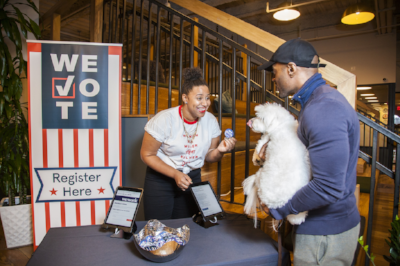 From September 24-28, the coworking company turned its 150 WeWork locations into “voter registration hubs.” WeWork members can check their registration status and register to vote. Some locations will also open their doors to the public to further increase registration. American Eagle announced a new partnership this week with Rock the Vote and launched a collection of limited-edition t-shirts featuring four customer designs. One hundred percent of the sales from the AE x Rock The Vote Graphic Tee Collection will go to support Rock the Vote. To get individuals excited about voting at a younger age, American Eagle is also sponsoring Democracy Class – a free curriculum to educate students on the importance of voting– in more than 2,000 high schools across the U.S.
Levi’s is also encouraging consumers to use their voice through voting with the rallying cry “It’s your voice. It’s your vote. Use It.” The denim brand launched a 30-second ad set to the song “Think” by Aretha Franklin which features diverse individuals heading to the polls. As part of the campaign, Levi’s also partnered with Rock the Vote to launch a limited-edition Vote tee. With the momentum of National Voter Registration Day and other similar days, we’re seeing a definite increase in company campaigns to encourage voting. And this investment is needed – as American voter turnout is low compared to most developed countries, with just 56 percent of Americans voting in the 2016 presidential election. And while many issues in politics today can be very divisive, “rocking the vote” is something everyone can agree upon – and gives companies a safe way to get involved in politics without necessarily taking sides.